That man looks like a monkey. they twinkle because they are having fun. now has a pinch of doubt. Poem by CB Follett from "At the Turning of the Light." I spent two delightful days and nights browsing in this charming and sensitive book of outstanding poetry, and find every page I've read to be filled with wonderful poetry... the poems offer us a wealth of experience and feeling, always cogent and understandable, never obscure, in a joy of imagery and accuracy of persuasion. The author explores the potential of free verse with great economy and a fine sense of when to stop...Originality of imagery and use of poetic device sounds on every page.. Her poems reveal layers of insight and juxtaposition of reality and inner dreams and are readily accessible. This is a poetry book to enjoy repeatedly, and I am pleased to place it on my shelf of memorable poetry. It graces our national poetic image, and the author deservedly is called a gifted poet. 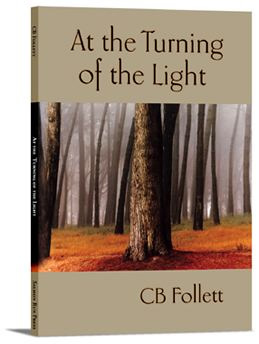 CB Follett’s At the Turning of the Light defies definition. She combines power, dramatic intensity and a sweeping flow. Her voice is like an instrument creating elegiac and celebratory music. Whether she is dealing with the natural world, a world with which she is infinitely familiar or the inner world touching upon pain, her poems are full of striking images. Her gift of observation, her natural acceptance for whatever life presents whether it be loss or gain is tempered by her wit and ability to look at things, on occasion, deliciously askew. At the Turning of the Light is truly an appropriate title for the subtle variations and multiple layer shades that color this fine collection. Your poems really spoke to me – I like their sinewy strength and the sense of a connection with the natural world…I found your poems fresh, surprising and overwhelmingly optimistic in a profound way….Frankly your poems make me happy!